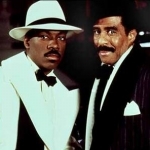 Harlem Nights is a Film programme that first aired in 1989 and has been classified a 18 certificate. Eddie Murphy and Richard Pryor star in this tale from the world of organized crime and police corruption in the 1920's. 1920s, where any underhand trick goes.